It’s official: Toyota will close down its NUMMI plant in Fremont, CA in 2010. The news comes on the heels of GM pulling out of the 25-year old joint venture two months ago. My question is this: why did General Motors have two vehicles that competed in the same class but were manufactured in different locations and used completely different platforms? The Chevy HHR and the Pontiac Vibe are both compact hatchbacks. The HHR is built on the Delta platform, which it shares with the Cobalt and Cruze. The Vibe was basically a rebadged Toyota Matrix, which uses Toyota’s Corolla platform. What gives? Why have two very similar vehicles manufactured in completely different ways? I’m beginning to think that GM saved more money by sharing parts, platforms, and manufacturing personnel with Toyota than it could possibly have done by using its own platform. I hope that is not the case. 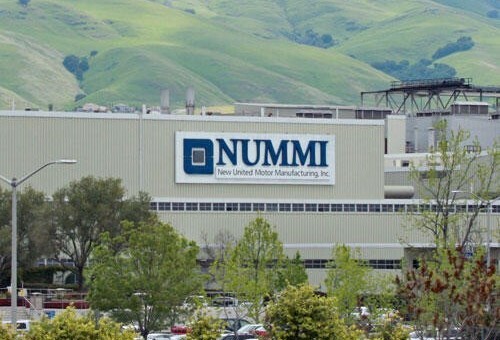 NUMMI, which stands for New United Motor Manufacturing, Inc., originally opened as a GM plant in 1962. It was then shut down in 1982 to reopen again in 1984 as a joint venture between The General and Toyota. NUMMI was the first automotive joint venture in the U.S. and was designed to make vehicles sold under both brands. GM saw the venture as an opportunity to learn about the ideas of lean and efficient manufacturing from a Japanese company, while Toyota secured its first manufacturing base in North America. The plant also provided Toyota the opportunity to implement its production system in an American environment and ecosystem. It was a raging success that initially produced vehicles such as the Chevy Nova, Geo Prizm, Toyota Hilux, and Toyota Volts – a reason why so many textbooks refer to NUMMI when discussing joint ventures. Detached Plastics facility fabricating bumpers, instrument panels, interior panels, and others. Stamping facility that fabricates all visible sheet metal parts. Welding facility that assembles all metallic parts into one rigid unit. A detached Paint facility to prepare and paint passenger vehicles. A detached Painting facility to prepare and paint truck cabs. Main building that assembles entire vehicles complete with redundant quality checks to ensure customer satisfaction at the dealership. GM also had a similar joint venture in place with Toyota and GM-Holden (of Australia) from 1989-1996 called the UAAI (United Australian Automobile Industries). Currently, some workers at the plant are understandably unhappy with the turn of event, but unless the state of California makes some sacrifices to keep the plant going, don’t expect much to change.